This holiday season has a lot of offerings for moviegoers who may feel like celebrating with a film full of special effects, nods to Hollywood classics, A-list actors, thrills, action and of course, romance. Some of these films will also dominate the awards season after the new year. For reasons of clarity, we want to note that this list includes only some of what’s in theaters right now and mainly represents the bigger, bolder, glitzier productions. We’ll reserve the higher brow award-worthy films for another time. Emma Stone and Ryan Gosling sweep us off our feet in the romantic musical La La Land, about two struggling artists in Los Angeles trying to follow their dreams while they fall passionately in love with each other. The bittersweet story is accentuated by a haunting musical score and infectiously upbeat choreography. This is a gutsy, creative musical by Damien Chazelle, the writer and director of 2014's award-winning film Whiplash. La La Land pays tribute to the golden Hollywood era and to musicals such as An American in Paris in 1951, and Singin' in the Rain in 1952. La La Land, however, fuses the traditional with the modern, giving the musical genre a new breath of life. The onscreen chemistry between the two stars is contemporary and at the same time reminiscent of old Hollywood couples such as Ginger Rogers and Fred Astaire. This film is not only joyful, moving and inspiring, but is a sure winner at the awards season and a must for the holidays. For those who love Star Wars and are especially attached to the original trilogy, Rogue One could satisfy. The battles, the star ships, the rebels fighting a desperate war against the totalitarian Empire while the Death Star looms over them, point back to the 70's...but in IMAX 3D, with even bigger and better special effects. Only the Grinch would offer spoilers but we can certainly assure you that you will enjoy it through the surprises at the very end. Felicity Jones stars as another strong female character in the Star Wars franchise, and she is surrounded by a decent cast. This is not as much a character-driven film as it is an epic battle story. Actors from left, Mads Mikkelsen, Ben Mendelsohn, Riz Ahmed, Felicity Jones, Diego Luna, Donnie Yen and Forest Whitaker pose for photographers upon arrival at the Rogue One: A Star Wars premiere in London, Dec. 13, 2016. Assassins' Creed is based on the popular video game and combines great martial arts scenes with the storyline of Callum Lynch, who unlocks his genetic memories through a revolutionary technology and experiences the adventures of his ancestor Aguilar in 15th century Spain. This high-action film is the perfect hybrid video game/movie which will attract the gaming community as well as fans of the film’s high-caliber stars, Michael Fassbender and Marion Cotillard. Those sci-fi lovers who crave an intelligent plot and a character-driven psychological drama will definitely enjoy Arrival, a tense story of extraterrestrial contact. Acclaimed filmmaker Denis Villeneuve offers a novel approach to the genre with mystical implications. Amy Adams has already garnered awards and nominations for her interpretation as the linguist trying to establish a language with the aliens. The film’s cerebral storyline will excite audiences who are called to solve a puzzle. This is a film that will stay with you for days. There are no battles and shoot-'em-ups, but the tension -- also embedded in the film’s haunting music -- is sometimes unbearable. 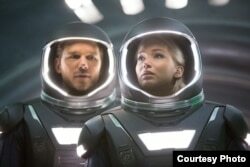 In Passengers, another sci-fi flick, Jennifer Lawrence and Chris Pratt are on a journey to a distant colony planet; but, a machine malfunction in their sleep chambers wakes them 90 years early. Soon, they discover that it may not have been an accident, as the ship that is transporting thousands of souls is spiraling toward a star. This high-budget film has special effects, popular actors and mystery, so it promises to do well at the box office. Whether it will garner praise remains to be seen, but it will surely put moviegoers who want to see collapsing stars, cool space ship gadgets and romance in a festive mood.